One of the things we do at Redgate is release software often. It’s not just that we want you to release your software often (and develop better), but we do it ourselves. Different teams release at different cadences, which is both cool, and hard to keep track of. The SQL Prompt team is really amazing, releasing hundreds of times in the last year. A pace of almost 4 times a week! 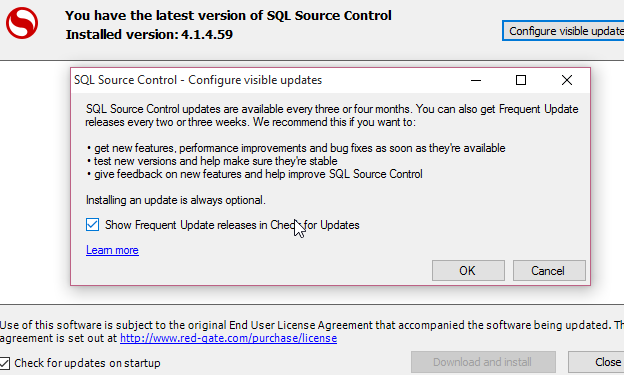 SQL Source Control is a product I’ve been using fairly often lately. There is a team working on updating the code regularly, and I recently found out that they had two different streams of software releases. This is so the development team can get early feedback on some new features, but also so you can get access to the new features, performance improvements, and bug fixes as soon as they’re available. As a result, we have a normal, mainstream channel for releases, and a frequent release channel. The frequent channel offers new updates every Wednesday whereas the normal channel releases are less regular. The releases tend to be every few months, depending on the feature set being worked on. The regular channel also rolls multiple frequent releases into one larger update. 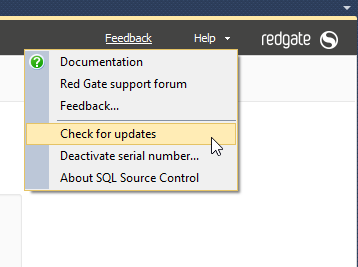 If you’re interested in getting frequent releases, then open SQL Source Control (SOC) and then click the help item. The “Check for updates” item is there, which is what you want to select. The update screen appears, and you may or may not have updates available. I don’t, as I updated this morning. However in the upper right corner is a “Configure visible updates” button. Click that. Once you do that, you’ll get a dialog that tells you that you might get more updates, every few weeks and get new versions. If you check the box, as I have, you get updates quicker. One note. This isn’t for beta versions. This is for code we are sure is ready, but we’re hoping to refine how it works and this gives us a chance to essentially have a additional test audience view the code and let us know. This is over and above the automated CI process we use and rigorous testing already completed by the development team. My experience is that I turned this on in early September to get the new Git support. I got the release with push/pull about three weeks before others (this has since been released to the regular channel). Since then, I’ve gotten two other releases that changed minor items, the same ones available to everyone else on the frequent release channel. The next regular channel release isn’t due until early 2016. And if you want to shape the product, please vote on UserVoice for the things that you’d like to see in the future. 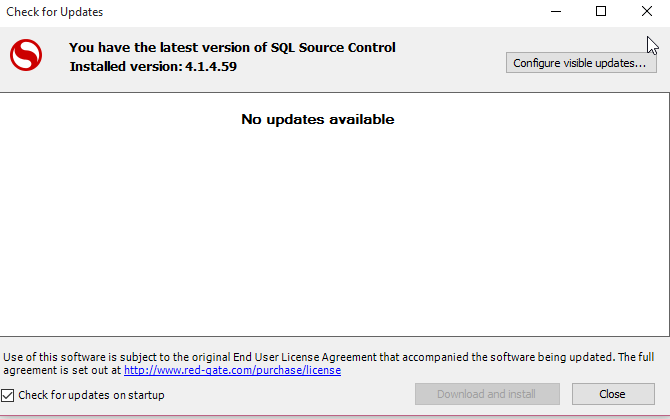 This entry was posted in Blog and tagged Redgate, SQL Source Control, syndicated. Bookmark the permalink. Hey Steve, thanks for putting the word out there about this. One other reason the team to put in this channel is that users were complaining about the frequency of updates (think Evernote!). Some people want the latest and greatest as soon as it is ready, but others don’t want to be bothered all the time. Obviously desktop software doesn’t have the same flexibility to update itself as web apps do, but that shouldn’t hold a team back from releasing continuously. This seems like a good solution to the problem… but if it isn’t working out for our users (for example, because it was so hard to find that they needed a blog post to tell them :-)), we’d like to hear about it.